رضائی, موسی, لطفان, سعید. (1394). تحلیل ارتعاشات غیرخطی و پایداری نانولوله کربنی حامل سیال در بستر الاستیک. نشریه پژوهشی مهندسی مکانیک ایران, 17(3), 27-48. موسی رضائی; سعید لطفان. "تحلیل ارتعاشات غیرخطی و پایداری نانولوله کربنی حامل سیال در بستر الاستیک". نشریه پژوهشی مهندسی مکانیک ایران, 17, 3, 1394, 27-48. رضائی, موسی, لطفان, سعید. (1394). 'تحلیل ارتعاشات غیرخطی و پایداری نانولوله کربنی حامل سیال در بستر الاستیک', نشریه پژوهشی مهندسی مکانیک ایران, 17(3), pp. 27-48. رضائی, موسی, لطفان, سعید. تحلیل ارتعاشات غیرخطی و پایداری نانولوله کربنی حامل سیال در بستر الاستیک. نشریه پژوهشی مهندسی مکانیک ایران, 1394; 17(3): 27-48. در پژوهش حاضر، رفتار ارتعاش عرضی غیرخطی نانولوله کربنی حامل سیال در بستر الاستیک با دامنه نوسانات بزرگ، مورد تحلیل قرار گرفته است. بدین منظور سیال گذرنده از نانولوله، غیرویسکوز و تراکم‌ناپذیر در نظر گرفته شده است. معادله ارتعاشی حاکم بر اساس تئوری الاستیک ریلی استخراج شده و با در نظر گرفتن تغییر متغیر مناسب، معادله به صورت قابل حل با روش اغتشاشات تبدیل و حل شده است. بر خلاف پژوهش‌های پیشین، رابطه تحلیلی سرعت بحرانی سیال که در آن اثر غیرخطی هندسی نیز لحاظ شده، استخراج گردیده است. در مقایسه با ارتعاشات کم دامنه و رفتار خطی نانولوله، با افزایش دامنه ارتعاشات عرضی، ناپایداری سیستم در سرعت‌های بالاتر سیال عبوری اتفاق می‌افتد. رفیعی، ر.، "تحلیل ارتعاشات غیرخطی نانولوله کربنی با استفاده از تئوری اغتشاشات"، مهندسی مکانیک مدرس، دوره 12، شماره 3، ص­ص 60-67، (1391). Hu, Y.G., Liew, K.M., and Wang, Q., “Modeling of Vibrations of Carbon Nanotubes”, Procedia Engineering, Vol. 31, pp. 343-347, (2012). Firouz-Abadi, R.D., and Hosseinian, A.R., “Free Vibrations of Single-walled Carbon Nanotubes in the Vicinity of a Fully Constrained Graphene Sheet”, Computational Materials Science, Vol. 53, No. 1, pp. 12-17, (2012). Yoon, J., Ru, C.Q., and Mioduchowski, A., “Vibration of an Embedded Multiwall Carbon Nanotube”, Composite Science and Technology, Vol. 63, No. 11, pp. 1533-1542, (2003). Yan, Y., He, X.Q., Zhang, L.X., and Wang, C.M., “Dynamic Behavior of Triple-walled Carbon Nanotubes Conveying Fluid”, Journal of Sound and Vibration, Vol. 319, No. 3-5, pp. 1003-1018, (2009). Fu, Y.M., Hong, J.W., and Wang, X.Q., “Analysis of Nonlinear Vibration for Embedded Carbon Nanotubes”, Journal of Sound and Vibration, Vol. 296, No. 4-5, pp. 746-756, (2006). Zhang, Y., Liu, G., and Han, X., “Transverse Vibrations of Double-walled Carbon Nanotubes under Compressive Axial Load”, Physics Letters A, Vol. 340, No. 1–4, pp. 258-266, (2005). Yoon, J., Ru, C.Q., and Mioduchowski, A., “Vibration and Instability of Carbon Nanotubes Conveying Fluid”, Composites Science and Technology, Vol. 65, No. 9, pp. 1836-1850, (2005). Yoon, J., Ru, C.Q., and Mioduchowski, A., “Flow-induced Flutter Instability of Cantilever Carbon Nanotubes”, International Journal of Solids and Structures, Vol. 43, No. 11-12, pp. 3337-3349, (2006). Ni, Q., Zhang, Z.L., and Wang, L., “Application of the Differential Transformation Method to Vibration Analysis of Pipes Conveying Fluid”, Applied Mathematics and Computation, Vol. 217, No. 16, pp. 7028-7038, (2011). Rasekh, M., and Khadem, S., “Nonlinear Vibration and Stability Analysis of Axially Loaded Embedded Carbon Nanotubes Conveying Fluid”, Journal of Physics D: Applied Physics, Vol. 42, No. 13, pp.135112, (2009). Soltani, P., Taherian, M.M., and Farshidianfar, A., “Vibration and Instability of a Viscous-fluid-conveying Single-walled Carbon Nanotube Embedded in a Visco-elastic Medium”, Journal of Physics D: Applied Physics, Vol. 43, No. 42, pp. 425401, (2010). Wang, L., “A Modified Nonlocal Beam Model for Vibration and Stability of Nanotubes Conveying Fluid”, Physica E: Low-dimensional Systems and Nanostructures, Vol. 44, No. 1, pp. 25-28, (2011). Rafiei, M., Mohebpour, S.R., and Daneshmand, F., “Small-scale Effect on the Vibration of Non-uniform Carbon Nanotubes Conveying Fluid and Embedded in Viscoelastic Medium”, Physica E: Low-dimensional Systems and Nanostructures, Vol. 44, No. 7-8, pp. 1372-1379, (2012). Li, J.J., and Cheng, C.J., “Differential Quadrature Method for Nonlinear Vibration of Orthotropic Plates with Finite Deformation and Transverse Shear Effect”, Journal of Sound and Vibration, Vol. 281, No. 1-2, pp. 295–309, (2005). Gorman, D.G., Reese, J.M., and Zhangh, Y.L., “Vibration of a Flexible Pipe Conveying Viscous Pulsating Fluid Flow”, Journal of Sound and Vibration, Vol. 230, No. 2, pp. 379-392, (2000). Paidoussis, M.P., “Fluid-structure Interactions: Slender Structures and Axial Flow”, Vol. 1, pp. 71-76, Academic Press, California, (1998). Wang, L., “Vibration and Instability Analysis of Tubular Nano- and Micro-beams Conveying Fluid using Nonlocal Elastic Theory”, Physica E, Vol. 41, No. 10, pp. 1835-1840, (2009). 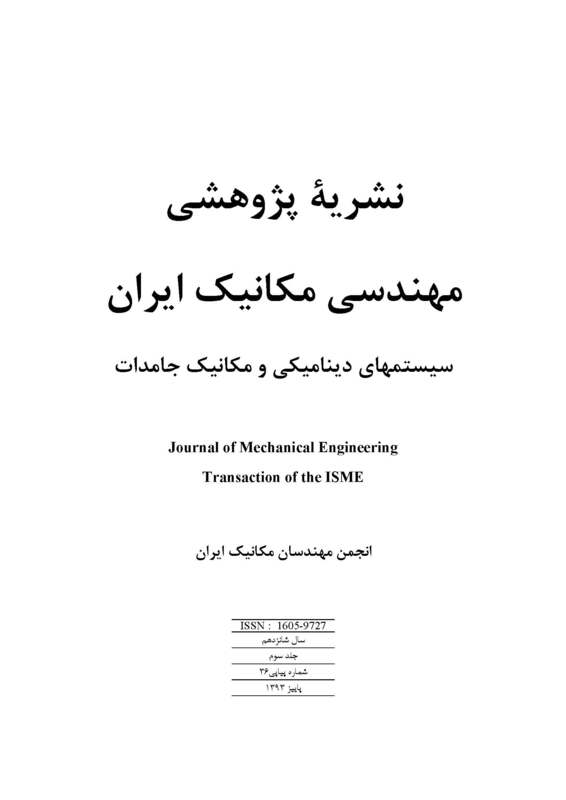 Khadem, S.E., and Rezaee, M., “Non-linear Vibration Analysis of a String under Bending Moment Effects using the Perturbation Method”, Journal of Sound and Vibration, Vol. 254, No. 4, pp. 677-691, (2002). Nayfeh, A.H., and Mook, D.T., “Nonlinear Oscillations”, John Wiley & Sons, New York, (1979). Wang, L., Ni, Q., and Li, M., “Buckling Instability of Double-wall Carbon Nanotubes Conveying Fluid”, Computational Materials Science, Vol. 44, No. 2, pp. 821-825, (2008). Shampine, L.F., and Corless, R.M., “Initial Value Problems for ODEs in Problem Solving Environments”, Journal of Computational and Applied Mathematics, Vol. 125, No. 1, pp. 31-40, (2000).